Automotive MMI: HDG Prices Lead the Way, But Will Auto Sales Continue Trucking into 2018? The Automotive MMI, tracking metals and raw materials used within the automotive industry, jumped 4.3% to a value of 97 for May. The U.S. HDG steel price tracked by the MetalMiner IndX jumped 11% to an 8-month high for December, last reaching its current level in April 2017. U.S. shredded scrap prices also spiked to an 8-month high, driving this sub-index higher. Our Auto MMI has had a stalwart Q4, with sustained values in the 90s. In fact, the last time this sub-index reached 97 was in September 2014. Auto sales in the U.S. were helped along by automaker and dealer incentives for consumers, with the return of the holiday shopping season — especially Black Friday, according to an AP report. Edmunds.com predicted “November sales will rise 3.5 percent over last year to 1.4 million vehicles,” according to that report. The historical picture, however, shows that while car sales are in a longer-term downtrend, light truck sales are in a longer-term uptrend, according to the WSJ. As for the Chinese auto market, vehicle sales increased by 2% year-over-year in October, growing for the sixth consecutive month, according to MetalMiner’s monthly metal buying outlook report. New-energy vehicle sales also boomed this year, driven by government incentives to support the EV sector. HDG prices, however, may be the biggest elephant in the room — not to mention often the single-biggest driver within our market basket of metals used in the auto industry. 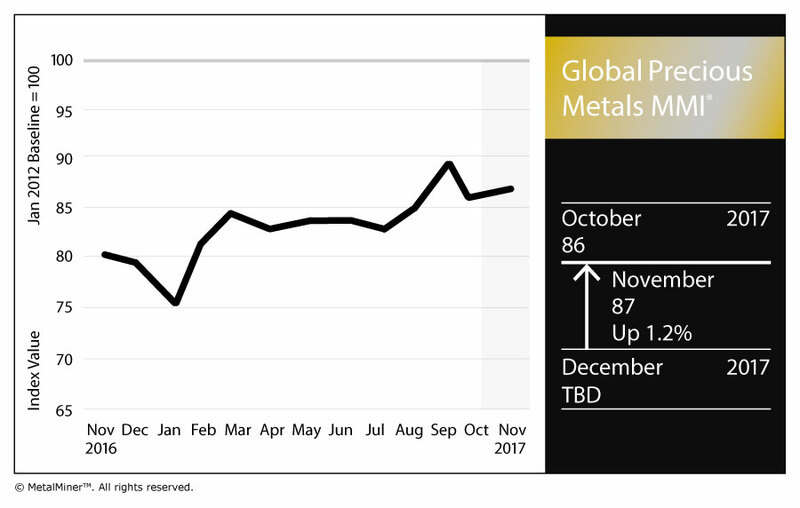 According to MetalMiner’s analysis in the monthly outlook, while 2016 saw a sizable increase in HDG prices, they’ve begun to level off to the point that real price strength is not yet evident. With slowing Chinese prices and pending circumvention cases, HDG prices may reverse this month’s uptrend just as quickly as it began. Log in or sign up below for exact prices this month! Over the past half-year or so, it seems as though the cannabis industry is putting out a new press release every other day. And due to relatively recent state-by-state legalization, cannabis’ economic boom and the growth of its supply chain seems legit enough to spawn this spate of news. In fact, just before beginning to write this article, I received another release on the latest industry growth numbers. And news just broke that the county in which MetalMiner HQ is based may get legal marijuana on an advisory referendum next March. Salad days for the green goddess! Why go into all of this? 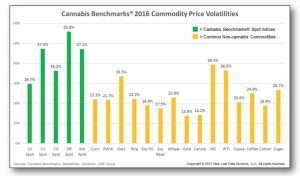 Cannabis may have a lot to learn from the industrial metals sector when it comes to commodity price volatility and risk. Not surprisingly, the report states that “market price volatility can be troublesome for all the participants in the value chain.” That is precisely why most supply chain players should begin thinking strategically about managing supply — and not just price — risk (more on that in the next section). 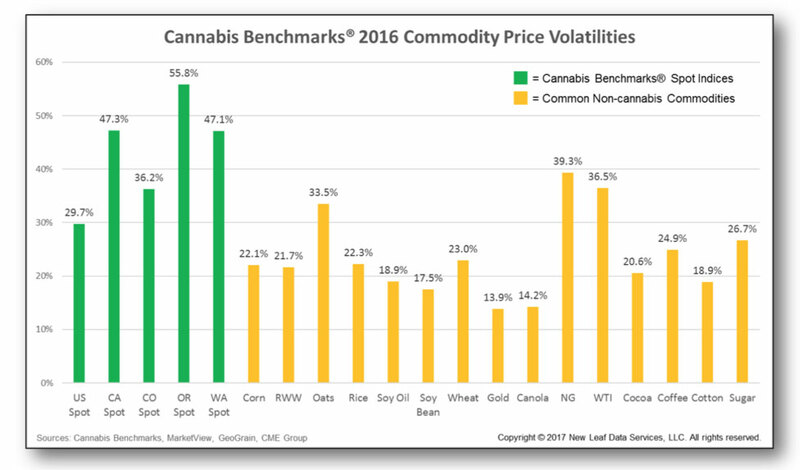 Also not surprisingly, while traditional supply and demand factors such as weather drive many agricultural markets, “significant price jumps in regional cannabis markets appear to still be driven largely by regulatory decisions,” which we’ve reported on in detail. With cannabis remaining illegal under federal law, this is a trend unlikely to change in the short term, according to the report. The paper goes on to outline the basics of hedging for participants in the cannabis supply chain — including the 101 on spot versus forward buying and contracts, OTC markets and swaps — with some examples to lay out what’s possible for the buyers and sellers within the nascent market. Managing commodity price volatility and risk requires beginning to think about it strategically. Lisa Reisman, executive editor of Spend Matters’ sister site MetalMiner, knows a thing or two about that. The notion of supply chain transparency. Knowing how each entity within the supply chain prices its products and services only helps the buying organization better understand total cost of ownership (TCO). Margin risk. By leaving the burden of extending quote validity periods or holding current pricing for longer periods of time to suppliers, the buying organization cedes control of its own ability to manage margins. Ultimately, the cannabis industry is such a nascent frontier that now is the time for participants can begin hashing out their own agreements, using benchmark indexes, specifications and the basics of hedging, according to the Cannabis Benchmark report. Read the original article over on Spend Matters here. Need more specific guidance around commodity price risk management strategy? Contact us! In case you missed it, just before President Trump went on his Asia tour (including a state visit with China’s President Xi Jinping), the U.S. finally went on record in ruling that China is still not a market economy for purposes of determining anti-dumping duties. To folks inside the Beltway on the front lines of trade policy, this is a big deal. So what will this mean for the U.S.-China relationship? What will happen if the U.S. slaps China with even bigger tariffs after the Section 232 investigation is completed? Will China retaliate? How? With everything that’s been happening on the international trade policy front over the past year, we wanted to give metal buying organizations more insight into the issues they may not be reading or hearing enough about — or at all — in the mainstream B2C media. If you’ve visited MetalMiner’s digital pages over the past several months, you’re no stranger to the phrase “Section 232” — shorthand for the U.S. Department of Commerce investigation into whether certain steel imports constitute a national security risk, under the namesake section of the U.S. Trade Expansion Act of 1962. The outcome of the investigation (findings from which were slated to come down last summer but have been delayed) could have significant effects on upstream and downstream manufacturing organizations, ranging from metal producers to buying organizations – even the mom-and-pops. But Section 232 is only one small part. Trade circumvention, China’s non-market economy status, domestic uncertainty amidst proposed tax plans and many other issues have pushed us to start this new podcast series. We’ll be publishing several more interviews in the coming weeks and months – stay tuned! Listen to more episodes and follow the MetalMiner Podcast on SoundCloud. Welcome to the (re)launch of the MetalMiner Podcast! In this first episode of the series, MetalMiner Executive Editor Lisa Reisman interviews Michael Stumo, CEO of the Coalition for a Prosperous America. Stumo’s concerns, and those of his organization, cut across industry sectors and political leanings. In this conversation, Stumo outlines what he sees as the most crucial elements to consider in today’s trade environment, touching on everything from China to the German Mittelstand to Alexander Hamilton as economic visionary. Follow the MetalMiner Podcast on SoundCloud. MetalMiner’s Global Precious MMI, tracking a basket of precious metals from across the globe, cooled off considerably after a sharp rise last month. For October, the sub-index dropped 3.4% to hit 86. That’s nearly back to the August 2017 level. Palladium held steady for a month, but still continues a measurable march upwards. The platinum group metal held above the $900 per ounce level for the second straight month. After breaking and holding above the $1,300 per ounce threshold at the beginning of September for the first time since October 2016, the U.S. gold price retraced its steps as well, diving back under that level for the beginning of October. Overall, however, investors have been seeing nice returns, according to International Banker. The article notes a Reuters poll “of 26 analysts and traders conducted in July, [in which] the average palladium price for 2017 [was] being predicted at $811 per ounce for this year, which is 5 percent above the previous poll conducted in April…[and] the highest annual average price on record, going back three decades.” Well, now we’ve broken $900 per ounce. Standing in for Fouad Egbaria, here is your morning in metals, folks. 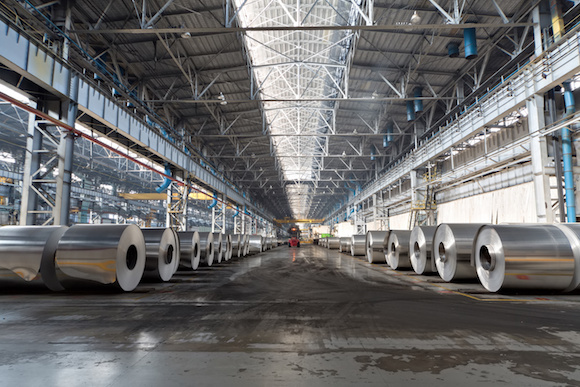 Feeling behind on aluminum industry activity and economic drivers? Look no further than the Aluminum Association’s latest comprehensive rundown, including import trends and key raw material inputs such as energy. President Trump made quick moves to ax the Clean Power Plan, whose benefits the previous administration said would dwarf its costs (of which, MetalMiner speculated, there would be many). Now, Trump and his EPA chief, Scott Pruitt, are trying to massage the numbers behind those costs and benefits — and it may be a tough proposition to get things right. Electric Cars All the Rage? Arnoud Balhuizen, chief commercial officer at BHP, was quoted by Reuters as saying on Tuesday that 2017 will be a “tipping point” for electric cars, adding that “the impact for raw materials producers would be felt first in the metals markets and only later in oil,” according to the news service. “In September 2016 we published a blog and we set the question – could 2017 be the year of the electric vehicle revolution?” Balhuizen said in an interview, Reuters reported. MetalMiner’s correspondent in India, Sohrab Darabshaw, will have an upcoming piece later this week about how that very revolution is shaping up in the world’s second-most populous country – stay tuned! MetalMiner’s Global Precious MMI, tracking a basket of precious metals from across the globe, tore itself away from a one-month downward trend to rise 4.7% for a reading of 89. That value was up from 85 at the beginning of August. Palladium continues its steady yet undeniable march upward. The platinum-group metal (PGM) crushed it with yet another recent high, ending up above the $900 per ounce level as of Sept. 1. As of this writing, palladium is holding on to that increase, still hovering near that level. Platinum is no slouch either, creeping upward even closer to its recent high of March 2017, when it landed above $1,000 per ounce. The U.S. gold price broke — and held above — the $1,300 per ounce threshold at the beginning of the month for the first time since October 2016. Unless you’ve been living in a cave, you would’ve been hard-pressed to miss the hurricane and tropical storm news of the past couple weeks. No sooner did Hurricane Harvey slam into the Texas Gulf Coast region, Hurricane Irma made her way up into the center of Florida soon after. Aside from natural disasters, other price drivers, such as political uncertainty surrounding North Korea and the U.S. Congress’ tussle over how to deal with the debt ceiling — and potential government shutdown — certainly have taken their toll on investor sentiment. How will the recent storm disasters affect precious metals prices? It could hit gold and silver refiners especially hard, as South Florida is home to one of the biggest precious refiners in the country and is also a hub for “assaying, refining, logistics and financing operations,” according to this article citing, ultimately, reporting done by the Miami Herald. If you’re in the market for those two metals, keeping an eye on the short-to-medium term aftermath of Hurricane Irma looks to be crucial. 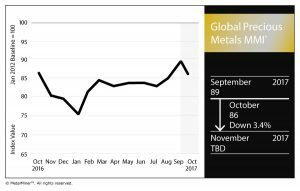 Of course, vehicle replacement in Texas and Florida post-hurricanes could do their part to support platinum and palladium prices. Be sure to check out how MetalMiner’s Automotive MMI fared. MetalMiner’s Global Precious MMI rose 2.4% to a value of 85, breaking into a new high for 2017. 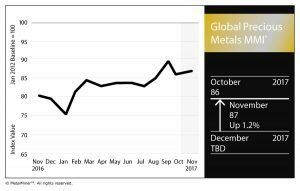 Our sub-index tracking gold, silver, platinum and palladium prices from around the globe last hit this level in October 2016, when it reached a value of 86. That makes two straight Augusts (2016 and 2017) of strong performance for precious metals. After a lackadaisical second half of 2015 and first half of 2016, the Global Precious MMI hit a scorching 89 in August 2016 — the index’s highest peak since February 2015. Since we tend to keep a closer eye on the platinum group metals (PGMs) due to their automotive applications, the U.S. platinum price tracked by the MetalMiner IndX ticked back up 2.3%, while the U.S. palladium price continued steamrolling, rising 3.4% on the month. These PGM prices increases, in addition to marginal upticks for gold and silver in the U.S., are the main drivers of the index’s gain. As we reported in June, platinum companies continue to battle for profitability — one such firm being South Africa’s Lonmin. After the company reopened shafts and expanded its biggest operation a couple months ago, it’s now planning to sell excess processing capacity “of up to 500,000 platinum ounces per year, to maximize cash from processing operations and preserve cash,” according to Reuters. The tough economic environment in South Africa, as well as inflationary pressures on platinum mining in general, are to blame. Certainly keep an eye on the global automotive sector, which has been motoring along lately in China especially, as the longer-term driver (HA!) here. The dog days of summer have shown life with a last gasp, perhaps setting the stage for a continued rise into autumn, especially if political turmoil gets any worse and any looming stock market corrections set the tone. 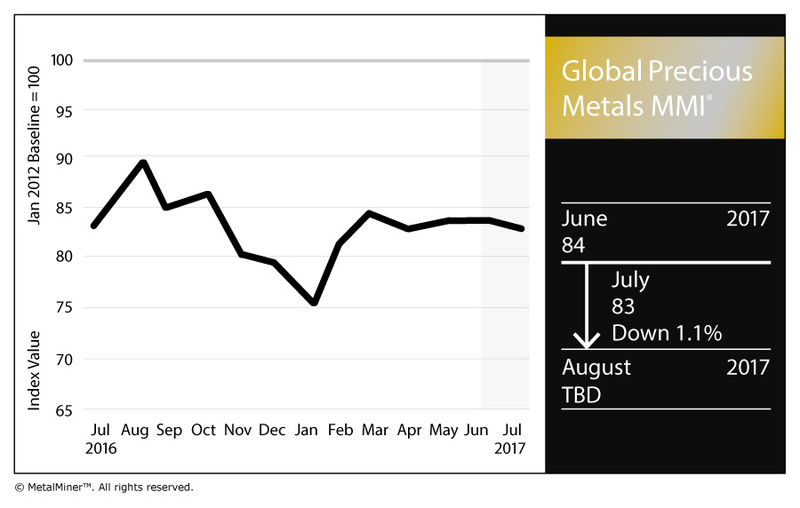 MetalMiner’s Global Precious MMI took a bit of a dip this month, coming down 1.1% to 83. The sub-index’s value held at 84 in June and May, but on balance, the price drops within the overall basket of metals couldn’t hold the ship steady into this post-Independence Day summer lull. While our U.S. platinum bar price got very close to its 2017 start-of-the-month low (which it hit in January; more on platinum below), U.S. palladium rose 3.8% month-on-month to record its highest price in 34 months — nearly a 3-year high. Diesel goin’ down? Due to negative sentiment after Dieselgate, as MetalMiner’s Editor at Large Stuart Burns pointed out recently, sales of diesel vehicles in some parts of Europe have taken a dive in the past few months over concerns that “authorities will raise costs or otherwise make living with diesel engines a less attractive proposition for owners.” Overall, total car sales have dropped in some European markets, including the U.K. — but in the spots where they haven’t, gas-powered vehicles have been winning over diesel. In short, not awesome for platinum prices. BEVs are not the panacea. Battery electric vehicles (BEVs) could be the ticket … except that the World Platinum Investment Council forecasts BEVs to make up no more than 5% of the market by 2025, so that wouldn’t work either. Of course, investor demand, jewelry demand and other industrial sectors, such as chemical, all play into it. But “platinum’s fortunes will in part ride on the coattails of the auto industry’s ability to re-establish the diesel engine as an environmentally acceptable propulsion unit,” according to Burns. Meanwhile, as my colleague Fouad Egbaria reported yesterday, gold is now trading on the LME. Last month, we wrote that “while we’re unsure of when prices will swing back up, mainly because output cuts in South Africa and elsewhere have seemingly not helped, it may be hard to discount current windows for smaller spot buys.” Fortunately for platinum spot-buyers, this still holds true.